A "simile" (pronounced SIM ih lee) is a figure of speech. It is a way to describe two things that are similar, or the same. The fun part is in choosing words to express fresh, new ideas in a fresh, new way. When you write a simile, you can show people something that's true that they have never thought of before! For this activity, you might want to ask each student ahead of time to bring in several different kinds of seeds. Give them several days' notice and remind them. Ask them to put each different kind of seed in a different container, and label them. Small zip-lock bags work well for this. Brainstorm the types of seeds that might be available in your area or from your grocery store right now: watermelon seed, acorn, fruit pit, milkweed pod, pine cone, and of course different kinds of flower and vegetable seeds available in seed packets purchased from garden stores, or collected from the students' own home gardens. When students arrive, each student should take a small scrap of paper and write a label for the type of seed he or she has brought, if he or she forgot to label them. If you brought five different kinds of seeds, then you need to write five labels so that the other students will know which seed is which. 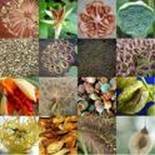 Now, on a table where all the students can see all of the seeds, lay out all the seeds that you have brought from home - watermelon seed, acorn, fruit pit, milkweed, pine cone, etc. Discuss characteristics. How are these seeds alike, and different? A mustard seed is as tiny as the dot on the letter "i." A watermelon seed is as black as a cat's fur on Halloween night. Underline the three parts of the simile - what you're comparing to what, and how they are alike. My seed is as sharp as . . . name 3 things it is as sharp as. My seed is the color of . . . name 3 things that are the same color. My seed feels like . . . name 3 things that feel like your seed. Finally, on a separate sheet of paper, draw a close-up view of your seed, and write a paragraph about it. Be sure to use a couple of your similes. Describe in detail what fruit, vegetable or other produce your seed will turn into. Best of all, go home and plant your seed. See if it ends up SIMILAR to your similes!